A bit bummed. I seen ALL of them at GameStop and was bummed to see that they did not have the metallic sheen the promo images have. I ordered and received my Proto Man, and have to agree with MegaNerdX... I was instantly a bit disappointed when I opened the package... the promo images of him like the one above look way better, and has that metallic sheen to it. Instead it was a flat red, and just the paint job in general looks rather cheap. To be fair, these are technically cheap, at about $12, and it's also my first Funko figure so I didn't expect the difference, but that's some shenanigans nonetheless. 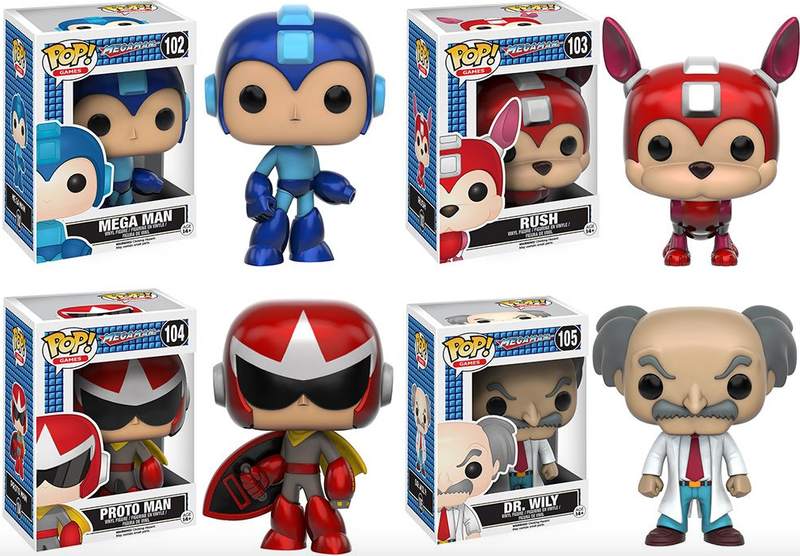 Glad I only bought one, never cared for how these look anyway, Proto Man was an exception. With Funko, always expect the promo images to look better than the actual product. I have other Funko figures where the paint doesn't match the promo image. They mat not look as good as the promo pictures, but I'm happy to have a Megaman collectable that's under $50. Yeah, I highly suggest people get these in hand before purchasing. Avoid Amazon and ordering online. I have seen a lot of paint and manufacturer flaws. Some have clamp marks across the body. I'm sure the Metallic versions will come in the form of a Hot Topic or Con Exclusive, and I imagine the "exclusive alternate paint apps" will be done to death for this wave. Paint flaws and manufacturing defects: just your typical "features" on every Funko Pop figure. lol, was just reminded of my old Onion day-calendar from college "Production Company tries to pass off Scene Selection and Language as 'Special Features'"
Yeah, I also expected the ice slasher and fire storm versions to be metallic. And they are flat. Not cool. I preordered these based on the paint job, because the mold is generic. I'm actually excited about these. Have the Fire Storm Megaman currently, plan on getting the others soon. They're great for posing in my office, good conversation piece, and so on and so forth. I'm not expecting model/paint perfection from Funko, just cool enough to place and show off.